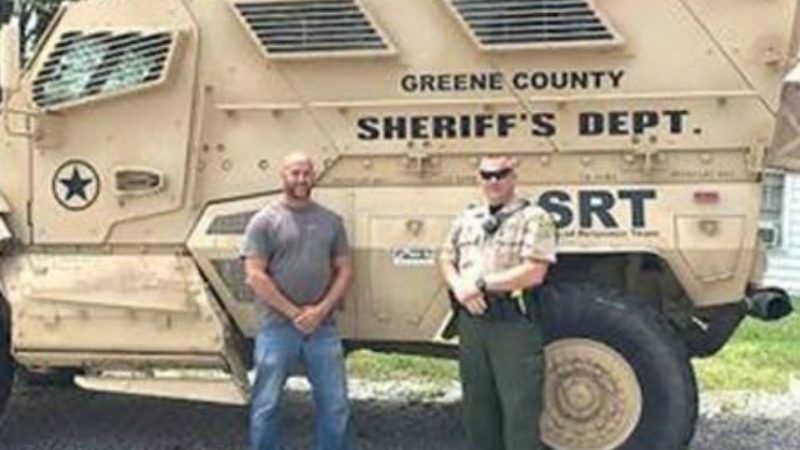 A sheriffs department in Tennessee is the lucky recipient of a military-style mine-resistant ambush protected (MRAP) vehicle. This is a vehicle that the U.S. Army uses to weather improvised explosives, rocket-propelled grenades, and mines. It will be put to good use! ! the Greene County Sheriffs Department replied. I suppose if radicalized Iran-backed Appalachian insurgents start planting IEDs along Shiloh Rd between Tusculum and Greeneville, theyll be ready? These giveaway programs from the Pentagon to local posses serve one major purpose: to keep pork barrel dollars flowing to the districts of key members of the House and Senate armed services committees. It's a complete scandal that local cop shops are being militarized just to feed the military-industrial complex's hunger to produce more heavy armored cars, for "free" if necessary. But of course, they aren't free. This is not a matter of a one-time surplus in these vehicles. This is an ongoing program and new MRAPs will be produced and purchased to replace these that are given free to local cop shops. I dislike the idea that military vehicles can be used routinely in civilian arrests. I think their use should be restricted to an authorization by the state's governor (or a police commission) to use these vehicles against civilian targets. MRAPs should not be used in civilian policing except in extremes, like a barricaded gunman. Or, possibly, the pursuit of a heavily armed known thug or terrorist, like the Boston bomber. Even then, there should be limits to using police as military units. If things are that bad, the governor should activate their national guard units, impose curfews and checkpoints, etc. There is, historically, a need to maintain a distinction between policing and martial law. An MRAP is inherently a tool of the military or of martial law. Hey Deckard! What's the phrase -- "Better to have and not need than need and not have"? Or don't you believe in that phrase anymore? Maybe Green Co SO should be given a M1A Abrams tank, and 3 or 4 A-10 Warthog's. You know, just to be "safe". Perhaps it could be adapted to till marijuana fields.